Unless your a vegetarian, you’ve gotta love a nice juicy steak, right. It’s HAS to be one of my favourite dishes of all time. Actually, scratch that. It IS my favourite dish of all time. A gorgeous slab of rare beef with all the trimmings is my idea of heaven. And my love of beef extends beyond a a t-bone or Chateaubriand. 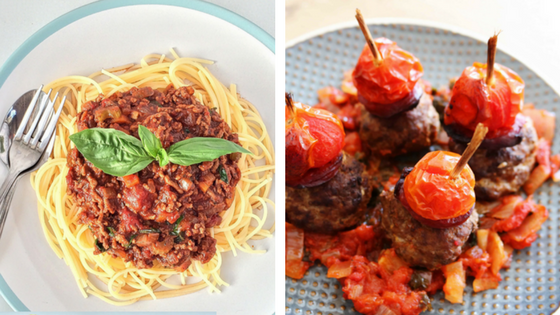 Who doesn’t love those home cooked comfort foods like cottage pie and spaghetti bolognese? And there’s definitely zero reason why you can’t include these dishes in your meal plans. These days you can get a plethora of different varieties of beef that are much more macro friendly than they used to be. Take beef mince as an example. You can get beef as lean as 5% fat. Perfect for being able to keep you tucking in to Mum’s old recipes every week. This week, I’ve got two recipes for you that I know you’ll love. There’s a Classic Bolognese, which is a perfect high protein meal. I’ve purposely left out the pasta in the dish, so that you can be flexible with what suits you and your macros. If you want to pile on the carbs, then cook up your favourite pasta and make a big batch for your meal prep. Alternatively, you can swap the pasta for courgette (zucchini for those across the pond) noodles as a low carb option. The other dish is mini meatballs and chorizo. The chorizo really elevates the flavour of the sih. It’s simple to make and reasonably low carb for those of you that need to squeeze it in to your macros. I’m sure you’ll love these two recipes, so get yourself in that kitchen and rustle up something that Mum would be proud of! Heat ½ tsp. coconut oil in a large pan and add the onion, carrots and garlic. Cook for 5 min, until onion is soft, then set aside. To the same pan, add the beef and cook for 2-3 mins. until browned. Return the vegetables to the pan, along with the chopped tomatoes, beef stock and herbs, bring to boil and simmer for 10 min. Season to taste with some stevia or other sweetener and salt and pepper. Serve with spaghetti or for a low carb version with zucchini noodles. Place the beef in a bowl and add the egg white, season with paprika, salt and pepper and mix well. Divide the mixture into 12 meatballs. Preheat the oven to 360F (180C). In the meantime heat a non-stick pan to high and fry the meatballs for 2-3 min. until browned. Place the meatballs in a baking dish, top each with a slice of chorizo and cherry tomato. Insert a skewer to keep them in place, then insert into the oven. In the meantime, using the same pan as previously, fry the onion for 2-3 min. Add in the parsley and chopped tomatoes and cook for a further 2 min. Season with salt and pepper. Now transfer the sauce into the baking dish and bake for 15 min until cooked throughout. There you have it. Liven up those Tupperware boxes with these great beef dishes. The guys and girls at work will wonder how these dishes can be part of a fat loss plan. Cook up a storm and leave them wondering what happened to all the dry salads and tasteless meals.